So we are well into Cleveland Beer Week, and I’m having quite a good time, that’s for certain. Friday night kicked things off with a wonderful Grains v. Grapes showdown at the Crowne Center Hotel downtown, featuring Brooklyn Brewery beers, and Brewmaster Garrett Oliver himself! I was very pleased to have the chance to chat with Garrett a bit, and later he signed his Oxford Companion to Beer for me. There are plenty of references to Jack in that book, as you would imagine. Next up came the Brooklyn Sorachi Ace with a tuna crudo with kalamata remulade and fried capers. I think I would eat fried capers on a shoe. And the main course really just was over the top tasty– a crispy pork belly with rosemary ginger sweet potatoes, almonds and a cider reduction served with the Spaten Optimator Dopplebock. Man, that pork was perfection. That was the one course I preferred the wine pairing–it was served with Crozes-Hermitage La Petite Ruche. Fabulous red. Finally, the wonderful dessert of a dense chocolate cake with sour cherry sauce was paired perfectly with Great Lakes Barrel Aged Blackout Stout, always a great beer. The party continued at the Gateway Winking Lizard with all the usual suspects–there was much beer consumed (like Southern Tier’s I-90 Pale Ale) and much fun had by all. 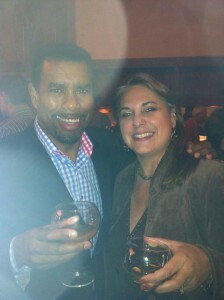 On Saturday, Paul and I celebrated birthdays with good friends, and didn’t make any official Beer Week events. But we made up for that on Sunday, when we hit a couple places and had plenty of great beer and amazing food. Mother Nature did not cooperate with the Market Garden Brewery’s Browns tailgate party that day, but in spite of that, there was a lively crowd at the restaurant, including some folks from the Cleveland Beer Week bus tour. 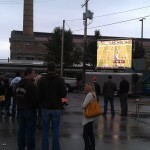 I enjoyed the Franklin Castle Pumpkin Ale especially, and watching the football action at the bar. I love rainy days on bar stools with my man. Our next stop was the Greenhouse Tavern for Rockmill on the Roof, which became Rockmill in the Restaurant, because of the aforementioned rain. We were barely seated when the waiter brought us our line-up of wonderful beers: Witbier, Saison, Dubbel, Tripel and the OYO Whiskey Cask Aged Tripel (oh my!). As we worked our way through these delicious brews, course after course arrived at our table. The Moules frites were the perfect marriage of potato carb-love and salty mussels. This was followed by the absolute best chicken and waffle dish I have ever put in my mouth. The waffles featured nuggets of beet sugar, and the chicken included some Witbier in the batter. Chefs David Maclennan and Brian Goodman certainly knew what they were doing. 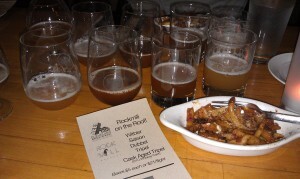 As does brewmaster Matthew Barbee at Rockmill–these combinations were outstanding. Our dinner finished with stuffed crepes and a pate melt, but I couldn’t even eat much of those, I was so full. My favorite beer of the evening was that Cask Aged Tripel. We sampled some more of that and a few other beers with cigars out on the Greenhouse patio as the rain cleared out for the evening. Great night. 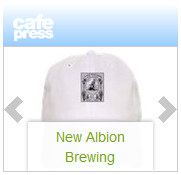 Monday it was back to work for Paul, but fortunately for me, my job now revolves around beer (insert big smiley here). 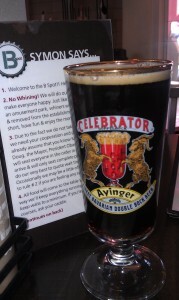 So it was off to lunch with an old friend at the B Spot in Eton, for a Lola Burger and the Ayinger Celebrator keep the glass deal. We had a great time catching up and chowing down. My Monday evening was spent at Lizardville with more of the usual Cleveland Beer Week suspects, sampling Akron’s own Hoppin’ Frog Barrel Aged BORIS; BORIS Royal; and Barrel Aged Belgian-Style Naked Evil Barley Wine! I also tasted the Double Pumpkin for the first time–really nicely done–not overspiced at all. Enjoyed talking to brewmaster Fred Karm as well, and congratulated him on his big GABF gold medal win. So here we are at Tuesday, and I’m finally going to get to my local Heinen’s grocery store for one of their daily beer samplings while I’m out running some errands. In fact, I’m going to try to get there at least once every day the rest of the week. And tonight I’m very excited to head over to the Chardon BrewWorks for a clambake and beer pairing. 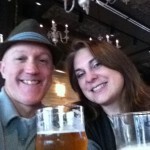 They are sharing their Private Reserve Homegrown Hops IPA, and I can’t wait to try it! Also, I’ll be enjoying some of that Geauga County Maple Porter as well. So much to taste — Cleveland Beer Week is the best week of the year! 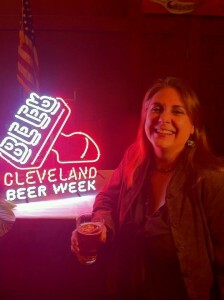 And the best part is, Cleveland Beer Week is a nonprofit–with all proceeds going to Jimmy Malone’s Scholarship Fund. Now that’s worth toasting. Cheers! Previous post: Cleveland Beer Week Eve!